크라쿠프, 폴란드의 호스텔 리네크 7 | 호스텔월드에서 예약하세요. What`s more every day we invite you for the Polish Vodka Tasting!!! Unique budget accommodation in Krakow's historic Old Town, situated exactly on the Main Market Square...? Only RYNEK 7 It is a fun, friendly hostel with the best location in Krakow. Occupying a 15th-century building, right in the heart of the city. 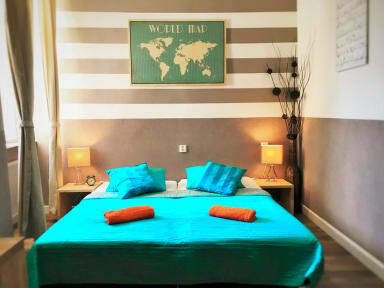 If you want privacy, HOSTEL RYNEK 7 has individually decorated rooms with satellite TV and private bathroom (next to the room). The dormitories offer free bed linen, lockers and modern bathroom facilities. Twin orDouble rooms has own private bathroom inside room. At HOSTEL RYNEK 7 you can meet other travellers, surf the Internet with free WI-FI and relax after a busy day of sightseeing - and before an even busier night out. Make sure you ask the friendly and helpful staff for advice - their tips will help you make the most of this beautiful city. 위치가 엄~청 좋아요, 조식도 괜찮고 직원도 대체로 친절합니다만 욕실청소와 설거지가 제대로 안되있어서 조금 불편했습니다. 광장 중심에 가장 좋은 곳에 위치하고 샤워실과 화장실이 충분히 있고 조식도 제공하고 친절한 직원 하지만 선풍기와 에어컨이 없고 광장의 많은 사람들이 밤늦게까지 술마시고 아침 일찍에는 쓰레기차가 와서 쓰레기통을 치울 때 유리병 소리에 아침7시에 강제로 기상하게 됩니다. 가격과 위치와 시설은 아주 좋으나 소음에 민감하신분은 피하세요. 그거말고는 다 좋습니다.